Callbreak, Ludo, Kitti, Solitaire and Jutpatti are the most popular games among board/card game players. Unlike other games like Marriage and 29, these games are pretty easy to learn and play. We tried to bring all those games in a single game, so you can enjoy different games without having to install and update different game.s Here are the basic rules and description of the games: Callbreak Game Call Break, also known as 'call-brake' is a relatively long-run game played with 52 cards deck between 4 players with 13 cards each. It's game rules are pretty easy to learn. There are 5 rounds in Callbreak game including 13 trick in one round. For each deal, player must play the same suit card. Spade is default trump card in Call Break. The player with highest deals after 5 rounds will be the winner. You can pick your bid, play with competitive opponents, make a correct bid for every deal to show off your skills and trick. Currently we're trying to build a callbreak multiplayer platform for Call Break, so please stay tuned. Once the callbreak multiplayer version is ready, you'll be able to play with your friends using hot-spot or internet connection. Ludo Ludo is probably the simplest board game ever. You wait for your turn, roll the dice and move your coins according to the random number that shows up on the dice. 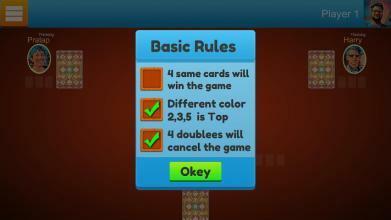 You can configure the rules of ludo and play with bot or other players at once. 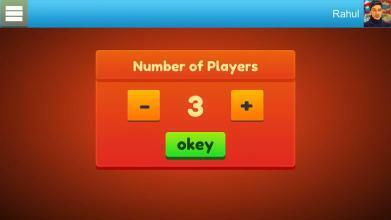 Ludo multiplayer is coming soon, so stay tuned. Kitti - 9 Cards Kitti is a short, fun game played with 9 cards each between 2-5 players. 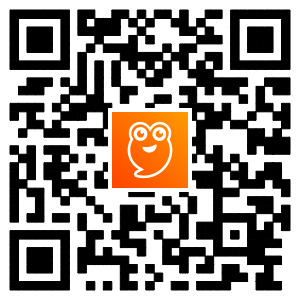 In Kitti you arrange the three groups of cards, 3 in each. Just like Teen-Patti or Faras, but to win the round, you should win two shows consecutively. Unlike call break, you show three cards at a time. Once the Kitti cards are arranged in three groups of three cards each, you show one group at a time, and compare with the other players' group. If your group of cards wins, you win that one show. The Kitti game runs for three shows each round. If nobody wins the round (ie. no consecutive winning shows), we call it a Kitti, and shuffle the cards again. 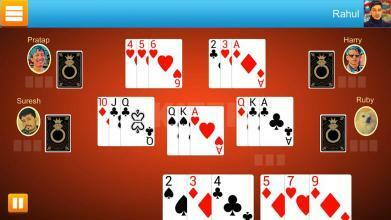 Solitaire – Classic After Call Break, Solitaire is probably the most played card game ever. This game includes a classic version of solitaire game that you used to play in a PC. Solitaire game is pretty easy to play and the rules are simple. The version of Solitaire included in this game requires you to chain the alternate cards. That means a red card can be chained with a black card. This rule makes solitaire a bit more challenging. 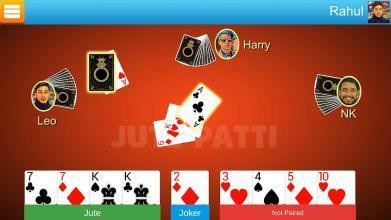 Jutpatti – Pair Cards Jutpatti is a pretty simple game played by children, or beginners. Jutpatti means "pair cards". You can distribute 3 to 11 cards between two or more players, and keep half of the shuffled cards face down. Turn by turn you pick the card from the face-down deck, or the one that the previous player throws. Once you pick the card, you have an even number of cards in your hand. Your target is to make sure there is a pair for every number. In Jutpatti, a joker is assigned right after distributing the cards. The joker is the next card in the deck, that is shown with face-up, and put besides or under the remaining cards. Joker is not the card that's face down, but the +1 cards. For example, if you turned 8 as face up, 9 is the joker; if J is face up then Q is the joker. A joker can be used as a replacement for any card to make a pair with. Most people who play Call Break love this game, so we included it in the game. We're working to include even more card games, include more controls and options in existing games, and building a multiplayer platform. Once the platform is ready you can play Callbreak multiplayer with your friends over the internet or offline with a local hotspot. Stay tuned for more games like Rummy, Dhumball, 29 Game and Marriage. Please send us your feedback, and we'll improve the game for you. Thank you for playing Callbreak, Ludo and more games.